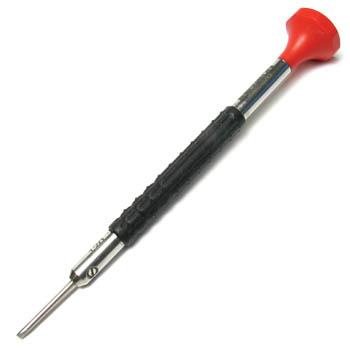 Genuine Bergeon Screwdriver Set features 10 different sizes. 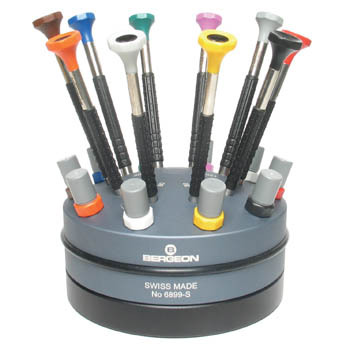 Watchmaker's Screwdrivers Set by Bergeon. Includes color coded mm diameters: 0.50, 0.60, 0.80, 1.00, 1.20, 1.40, 1.60, 2.00, 2.50 and 3.00, each with two spare blades. Rubber knurled grips and swivel heads provide precision control. Stainless Steel blades. Heavy weighted rotating stand stays put on your bench, always close at hand. Swiss made. Bergeon 6899.